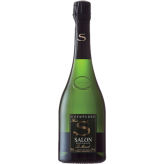 “Salon is the most elusive of Champagne’s grand marques. Only made in what the house deems the very best years, Salon has been bottled just 38 times since 1905, its first vintage. Even when it is released, production is tiny. Consider that there are just 5,000 cases of the 2002 for the entire world, a virtually insignificant amount by Champagne standards […] Because production is so limited, older vintages of Salon are very hard to find. Created in 1911 with first vintage 1905, this Champagne is produced from a one-hectare parcel owned by Salon (“Salon’s garden”, a vineyard of deep limestone and chalk ) and from 19 other smaller parcels in Le-Mesnil-sur-Oger. The parcels were chosen at the turn of the century by Aimé Salon, who headed Salon until his death in 1943. The wines are cellared in the bottle sur-lie for an average of 10 years, gaining complexity and finesse. Because they do not go through malolactic fermentation, Salon has been described as “stern” while young. This is a wine that benefits from 30 to 40 years of rest. This is a wine worth the wait.